The danged ethics alarms start ringing loudly at the oddest times. On Thursday afternoon, I was completing a cab ride from Houston’s Bush airport to the downtown law firm where I was to participate in an elaborate Inn of Court presentation, when I noticed some fine print on the window to my left. In its wisdom, the state of Texas had a) designated me a senior before my time, and b) decreed that such newly-minted seniors were among those guaranteed a 10% discount on their can fares. I had two disparate reactions to this stunning development in rapid succession. First, in the tradition of Shirley MacLaine in “Terms of Endearment” when she raged at her daughter (Debra Winger) for becoming pregnant and thus making it imminent that she would be a grandmother, I was ticked off. Then I thought, “Well, what the hell. If Texas wants to save me money (this was going to be a hefty fare), why should I stop it?” Then the ethics alarms started ringing. The law wasn’t going to save me money, but my hosts, the law firms that were holding the event and paying my expenses to participate. Surely Texas’s law was aimed at giving big firms a 6 dollar break on can trips from the airport. Taking the discount, which required me to ask for it, seemed contrary to the spirit and intent of the law. Having thus determined to decline the discount, I remembered my duty to clients. I am obligated to charge them for reasonable and necessary expenses, not ethical ones. If I can save a client six dollars or so by just opening my mouth, isn’t it unethical not to do so? Then again, I wasn’t sure the firms and the Inns of Court were truly clients in the typical sense, since I was volunteering my services as a contribution to the American Inns of Court program, which is dedicated to fostering the more ethical practice of law. I was really more of an invited guest than contractor, and already saving my hosts lots of money by waiving a fee for preparation, time and services that would normally be in the thousands. Why was I worrying about the six bucks? For there was also the cab driver to consider. Of all the parties, he was the one who most deserved the six dollars and presumably had the most need of it. I could justify Texas picking his pocket for the benefit of those on a fixed income, but not so some law firms and their partners could avoid paying expenses they wouldn’t notice, when they were already getting a bargain in their transaction with me that made the amount trivial. That clinched it. I decided to ignore the discount. The cabbie got to keep his 10%, and since I figure that into my tip (which was 20%), the net difference was close to eight dollars. Finally, the ethics alarms stopped sounding. And my goal is to make everyone’s ethics alarms work like this. The ‘elderly’ or ‘senior’ discounts stem from a stigma in society that lumps our aged society together with those who have some form of disability (or just flashing a disabled card) that is based on a presumption these people need more care or special treatment. As a double, discounts are seen as a form of “respecting your elders”. Elders in a society have generally been identified as such either by physical attributes and/or which generation they belong to. The older the generation, the more respect is deemed, and so forth. You were very kind in remitting full payment to the driver — something that happens more often than not due to people like yourself taking offense to the new-found re-categorization — even if it is specific to the area of the world you are in. Given that mans measurement of time itself is flawed, should glean insight that measurement of ones life using an extension of this flawed mechanic is also flawed — especially so when determining a said age group (aka ‘seniors’). It is in part an issue with the measurement of time, and lumping people together in a group via averages determined on locality and essentially, a rough “educated” guess. I’ll tell you the way I see it…First, I’m 68 and by any one’s measure (sadly, including my own) I am a senior citizen. I don’t necessarily feel that I am due a discount because of an accident of my birth, but if it’s offered, I’m going to take it, if for no other reason than that I have managed ti live this long and have not utterly destroyed myself because of some of my stupidity. In short, I’ve sort of earned it. I have never really felt any stigma attached to me because of my age, but then I’m rather big and still fairly fit so most folks, I assume, would be somewhat inhibited from trying to attach a stigma. This is especially ironic since “seniors” are the most affluent demographic group. Maybe in Texas, but the middle income folks living on a fixed income and retired in my state would probably disagree. Considering that Jarvis-Gann is in danger of being rolled back by our idiot legislature and Governor Jerry Brown push to built trains that go nowhere when industry is leaving the state in droves, let the seniors pick up a few cents on their discounts. You have my sympathy, partner. Gov. Brown found a way to put state tax on social security retirement benefits, yet? You’d be welcome here anytime you want to move. Jack, you handled your opportunity with the cabbie the same way that I handle my opportunity (albeit inconsistently) at a local hardware store, which offers military veterans a discount. When I go to that store, my wife keeps reminding me to mention my military veteran status and to show my ID when checking out (I think the discount is 10 percent). I have pursued the discount, and not pursued it, between one store visit and the next, for varied reasons. Sometimes, I just forget to show my card. Sometimes, I make a painfully expensive purchase that riles me for one external reason or another – “green” (extra toxic) light bulbs, for one example, and high sales taxes, for another example – and I “get even” in my own petty way by flashing my ID. Sometimes, I presume that it’s likely that every employee of that store has lower income than I, or fewer or poorer career prospects than I have had, and I deliberately forego the discount. Once in awhile, I find that at least one of the employees I have encountered on my visit is a military veteran who paid more dues in the service than I ever did; in those times, I actually feel as if I would be robbing that person, not to mention dishonoring him or her, if I took the discount. I can see how using the discount works for some service people like cab drivers, but how does it work for store employees? If you don’t take the discount does the employee get the difference? Can you take the discount amount and give it to the employee? I like the idea of using the discount to improve the paycheck of the employees, but not sure how it’s done. My daughter is working her way through school in a restaurant that gives a senior discount and it would be nice if she got the discounts of people who choose to use them that way. I’ll bet there are lots of people who are eligible for a discount who don’t really need it and who could use it this way. It would be very nice if the restaurant set up a program like that. Practicing frequently with the small stuff is preparation for dealing with larger issues. Of course, it can still be “annoying”, like a daily workout. You figured it into your tip but did he? This is where the flaw of imposing non-market driven price regulations onto the market is exposed. 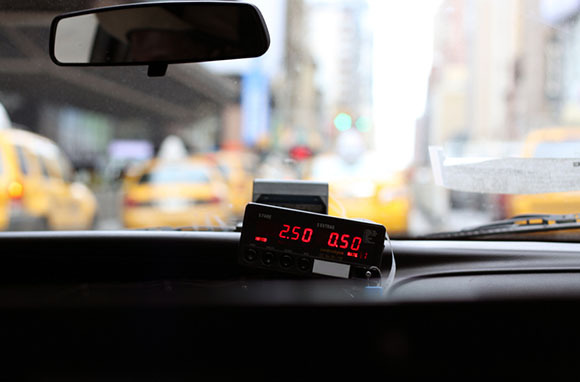 The value of a cab ride doesn’t change based on age of rider. 1) Your argument that you are obligated to save those you are contracted with the additional money is fair. However, EVERYTHING you do in life is paid for by your Clients. Everything. Should your logic then be carried on: I must eat much less expensive food, I must buy the cheapest car on the market, I must live in the least expensive house, that way, my own personal budget is as low as possible. Therefore my annual compensation can be lower, in order to reduce the costs to my clients. 2) If the law wishes to alleviate the burden on seniors, it musn’t do so in a way that infringes on the Cab company’s ability to run its business. a) The law as is, compels the Cab companies to gain less profit, or even take a loss for carrying seniors. The Cab company then, must regain that revenue elsewhere, by raising the overall cab fare across the board or accept less revenue. Therefore other riders are footing the bill for seniors (this is not fair for other riders). b) The law COULD reimburse seniors, upon presentation of proof of cab fare (except I don’t think cabs have receipts). This method ensures the Cab Company gets its full revenue and doesn’t have to unfairly shift costs to other clients. It does however shift the costs to all the tax payers in the State. I think this would be MORE fair than the existing law.